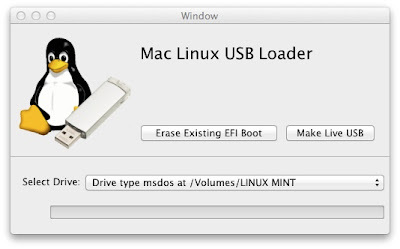 SevenBits has written a new Mac Linux USB Loader tool that allows you to take an ISO of a Linux distribution and make it boot using EFI on Mac. Macs require booting via EFI, which for all intents and purposes is horrible on the Linux platform. The only real way to boot Linux via EFI is unfortunately by hacks: GRUB 2, the rudimentary and ubiquitous Linux boot loader used on practically every installation, has working but poor EFI support, and other software like ELILO is not much better. So, what is to be done with PCs (and Macs) that are now booting via EFI? I have one solution for a common issue faced by Mac users: booting a Linux distribution from a USB drive without using rEFIt or rEFInd. The tool is necessary to make certain Linux distributions boot that do not have EFI booting support. Many distributions are adding this with the release of Windows 8, but it has not been finalized and is still nonstandard by most distros. The tool copies any Linux distribution ISO to the USB along with some special EFI firmware. This firmware is based on GRUB and it is invoked by the Mac upon boot. Once invoked, it then boots Linux normally from the ISO as if BIOS was being used. Mac Linux USB Loader has been tested with Ubuntu and its derivatives but it should work with other distros as well. It is still in beta stage so there can be some issues though. I don't have a Mac so I couldn't test it but if anyone is interested in using the app, check it out on GitHub.